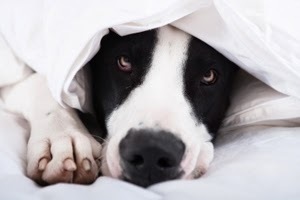 Does your pooch hide under the covers when she hears non-stop loud booming noises, aka fireworks? Never fear—the ASPCA has some sound strategies for ensuring that your pets remain safe this July 4th weekend. We think the biggest takeaway is to keep your dog at home and preferably indoors, at least during your areas' biggest fireworks displays. If you have a fenced yard where Rover typically roams, you may also want to double check the entire perimeter of the fence to make sure there are no visible escape routes, just in case your pooch is outside when a neighborhood kid sets off some personal firework displays. And don't forget that the ASPCA has a brand new interactive pet parent App with lots of nifty features to help protect your furry best friends. And just so you know we're not playing favorites, the Humane Society of the United States has some timely tips for your pets' 4th of July safety. Remember: it's not just the loud noises but the flashing lights and strong smells that can scare the dickens out of your dog and give him or her the urge to flee. It helps to keep your home's windows closed and leave on the TV or have soothing music playing to help drown-out the outside commotion. We hope that you and your pets have a fun and safe July 4th weekend! We'll both be hanging out inside, although fireworks don't seem to bother either of us. I'll be hanging out on the bathroom rug. I hate fireworks! Happy 4th to you, Bocci!